SPECIAL ALERT: If you are using a Home Theater system (Sound Bar, A/V Receiver, etc.) to output the sound from your TV, we strongly recommend that you not install this update yet. With this software version and some Home Theater systems, an issue may occur where you will not hear sound through your Home Theater system if the TV remains on standby for too long. While workarounds are available, we recommend you wait until the next update, which will resolve this issue. 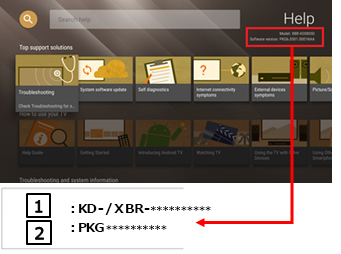 NOTE: If the update is already installed on your TV and this problem occurs, follow the steps in this article to fix it. NOTE: Make sure that the "Automatic software download" function is enabled (this setting is enabled by default). IMPORTANT: The following "System Requirements", "File Info", "Download" and "Install", sections relate to the USB storage device update procedure. You can ignore them if you completed the update using the “Automatic software download” feature. Do not turn off the TV or disconnect it from power while it's updating. Stop any recording before you start the firmware update (USB HDD recording models only). Verify that the size of the "sony_dtvota_2016_1605830100_bra_auth.zip" file is "1 889 176 906" bytes. After you extracted the downloaded file, you will find the file "sony_dtv0FA60A0AA0AA_00004400_16058301000205.pkg". Copy or drag and drop the file "sony_dtv0FA60A0AA0AA_00004400_16058301000205.pkg" to the root directory of your USB device. Insert your USB storage device containing the file "sony_dtv0FA60A0AA0AA_00004400_16058301000205.pkg" into a USB port of the TV set.